Asking just $22.00 -- OR Make me an Offer !! Buyer to pay U.S. Shipping, or item can be picked up. Cash or Money Order only. 1940's - "The World's Greatest Toy" (The A.C. Gilbert & Co.) In Original, Red Steel Box with 2-Brass, Front Corners (Fair Condition). Has Partial Decal on Lid. 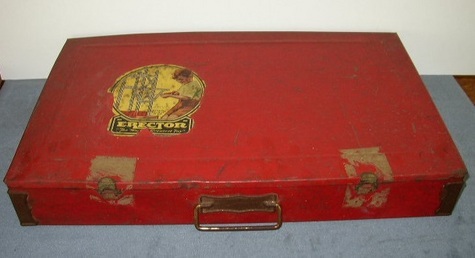 Inside Lid Decal (Good Condition) "The Great NEW Erector" (Builds Ferris Wheel). Comes with the Original Manual (which has a loose Cover & 1st couple pages - but is Complete). The Erector Set is Nearly Complete & there is some light to medium rust & paint loss on some parts (most could be cleaned). See More Erector Set items in my online store !